Magicians; the butterflies of entertainment. Sure they look pretty, but what do they actually do? Would anyone miss them if they vanished? Are the bright costumes merely a cry for help? Four of the best amateur magicians are selected from the throng of card sharks, shysters and con men and summoned to New York City by personalised tarot cards. 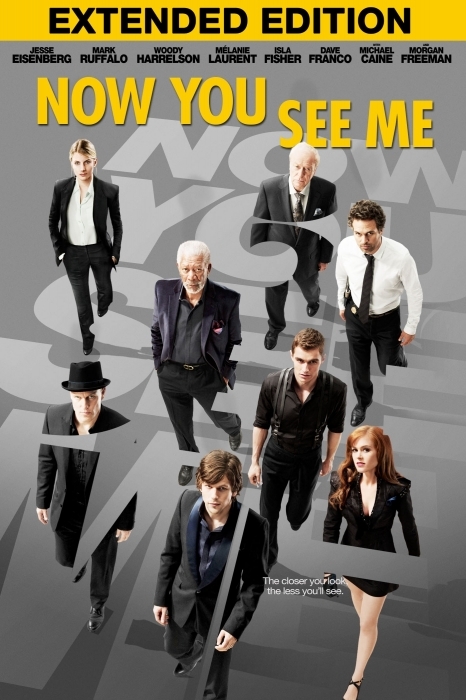 In short they are J. Daniel Atlas (Jesse Eisenberg), mastermind and sleight of hand expert, Merritt McKinney (Woody Harrelson) mind reader, Henley Reeves (Isla Fisher) escape artist and Jack Wilder (Dave Franco)… Ummm pickpocket? Now a headlining quartet in Vegas dubbed The Four Horsemen – despite one being a woman – the crew perform amazingly intricate and unlikely shows for astonished and transfixed audiences. Watching from the stands is the show’s delighted financier Arthur Tressler (Michael Caine), and professional magician debunker Thaddeus Bradley (Morgan Freeman), a former magician who decided there was more money to be made by releasing DVDs that explained and spoiled the magician’s tricks. It is when one spectacular culminates with the apparent robbery of a major French bank, with the audience sharing in the millions in ill gotten gains, that more diligent and serious scrutiny arrives in the form of FBI agent Dylan Rhodes (Mark Ruffalo) and French Interpol agent Alma Dray (Melanie Laurant). As the shows – and targets – get bigger, the pressure becomes greater. The authorities close in despite having no apparent clue as to how the jobs are being pulled off, the audience and following grows across the globe, and Thaddeus Bradley smiles knowingly a lot. Eisenberg shows more charisma than he has in previous films where his deadpan, dust dry delivery helped build his reputation. Here is is Zuckerberg via Jimmy Fallon. Harrelson is perfect to play a smarmy yet likable shyster, the man who you can’t help but appreciate even as he drags the cash from your wallet, and Franco and Fisher always seem a little thin, fake and forced in lightweight roles – which considering they are playing magicians seems suitably apt. There are lots of dramatic wide circular camera pans, even more long and technically proficient sequences of pithy dialogue, and a bunch of guys n gals who were likely derided at school for being nerds hold your attention in the palm of their hands for two hours. It’s flashy. All style and no substance, requiring leaps of logic, suspension of disbelief and wilful misdirection. In short Now You See Me is contrived, slick and just as fake as a real magic show, with a finale that will initially astonish, but ultimately leave more questions than answers. But ‘hey’; it’s a show, and despite being all empty colours and fragile wings, this is occasionally a very pretty – if unnecessary – butterfly. Final Rating – 6.5 / 10. Perfect DVD movie. One of the rare inoffensive, blatantly commercial and reasonably entertaining films of 2013.